2 Blinds On 1 Headrail (5) ? 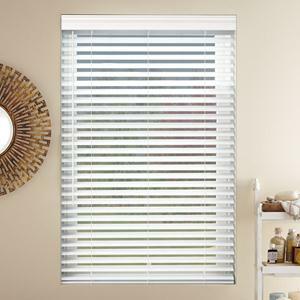 Welcome to the wonderful world of wood window treatments here at Select Blinds! 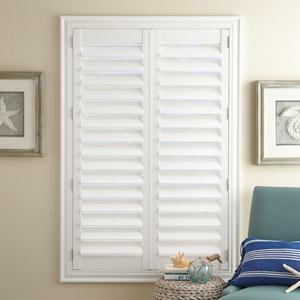 An attractive and affordable alternative to shutters, wooden window blinds are a natural choice. There’s nothing like the old-world quality craftsmanship of woods to add sophistication and timeless style to any space in your home or office. Our highly rated and reviewed custom wood products are a favorite of designers, and have been featured on programs including Fox Network’s Home Free. We understand when looking for real wood window treatments it’s sometimes hard to see the forest for the trees. That’s why our selection includes everything you need to find the perfect wood window coverings to complement your unique taste and style. Wooden blinds are made from natural, furniture-quality hardwoods, like basswood and American hardwood. They’re lightweight and easily mounted outside or inside the frame, making them perfect for large or wide windows. Because they’re lightweight, they won’t bow or bend as easily as other types of coverings, making these classic window treatments a stylish and economical long-lasting investment. We’re proud to offer a cordless lift option with all of our natural wood shades. In addition to giving your style a lift with a chic, clean, no-strings-attached look, cordless wood treatments help keep young children and pets safe. Choose from our classic cordless lift, Cordless Lift & Lock™, or regular corded easy lift systems. It’s easy to customize your wood and basswood blinds with a rich rainbow of colors and stains to match any interior and decor. With everything from bright white to traditional dark cherry or mahogany, you’ll find the perfect color or stain to make your dream design a reality. Accessorize your treatments for a total designer touch with color-coordinated or contrasting cloth tape binding for a unique look all your own. It’s easy to coordinate your wood window and door treatments throughout the entire house. With 1”, 2” and 2½”slat sizes to choose from, you can create a continuous, streamlined design with all your coverings. Some styles also offer standard or rounded slat corners to further customize your treatments. When covering large windows, placing multiple units on a single headrail makes it easier to install and manage your wood window treatments versus one large covering. Using two or three wood products together also produces a more streamlined look and lets you choose which sections to raise or lower so they don’t interfere with opening and closing your doors and windows. For more information on the benefits and beauty of custom wood window coverings, check out our style buying guides. Ready to order? Start with some free samples and our handy measuring instructions.